Tame unruly hedges. Phone Steve Molyneux Tree Care of Hastings, East Sussex, for a precision hedge trimmer who'll tidy up your shrubbery in no time. Benefit from Steve Molyneux Tree Care's expertise with our pruning services. 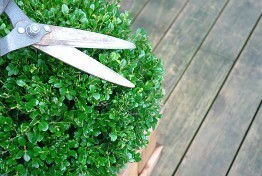 We'll gladly trim your hedge down to a box border when your shrubbery has got a little out of hand or needs neatening up. hedge trimmer who'll keep your hedgerow neat.